2.Colleagues’ recommendation and personal preference. Yes, you got me, Axure is again listed first and I believe it’s well-deserved. As the largest and most well-known application in the whole prototyping industry, it is powerful in quickly creating high-fidelity prototypes of responsive websites and mobile applications. With components from Widget libraries, you can make click-through wireframes, user flows, sitemaps and interactive prototypes. The only limit is your imagination. But what’s comprehensive and functional is always unable to get rid of the question that it has a steep learning curve, and it’s become steeper and steeper. If you are a professional designer, please don’t hesitate. At the mere mention of Mockplus, It seems that the word ”fast” is redefined. Mockplus is a Desktop based application which is made for designing both web and mobile webs. Featured in visualized interaction design, Mockplus is packed with numbers of pre-designed interaction components and more than 3000 icons, creating design faster and easier. Moreover, all of these can be previewed in 8 different ways. According to my experience using Mockplus for weeks, I have unconsciously been deeply accustomed to the operational logic of it. Aiming at making the sophisticated prototyping fast and simple again, Mockplus surprises me not only for its simplicity and speed (Everyone can learn to use it in half an hour), but also for its powerful functions. For example, although Mockplus claims to be a low-fidelity prototyping tool, we can also try to make high-fidelity prototypes on it. Look at the price again, believe me what you are looking at is just like the Apple I in Steve Jobs’ garage. If you want to get a powerful rapid prototyping tool with a reasonable price, then you can’t miss it. Flinto is a web-based prototyping light application which allows you to create prototypes from simple click-through prototypes to more comprehensive prototypes with interactions. On Flinto, there is not anything like timelines or programming. Designers can simply put things where they want it to go and have the control over each layer. Once you start a project, all you need to do is to drag and drop. If you are one of the computer geeks, you will definitely be amazed at the loading speed and I love using it especially for the “aha” moments like this. To make it more like a real application, Flinto allows you to precompose icon and startup image, don’t skip it because it ensures your design to have a better texture. Justinmind is a flexible prototyping tool. It provides designers with best solutions to feature-rich mobile App design. It supports multiple terminals and is competent of making prototypes from simple to complex only by clicking your mouse. Justinmind might be a little difficult to learn, butit’s worthwhile. It’s available to add interactive features to your already-designed wireframes or to use pre-set standard component library to create interfaces. If you are a fan of high-fidelity prototyping, Justinmind is your type. At your first sight at Balsamiq, some designers might criticize the hand-drawn style as a prove of not professional. On the contrary, in the process of prototyping, the hand-drawn style in fact forces designers to fully concentrate on functions, layouts and interaction. In case you hear critics like“I’m not very into the color you paint at the button.” Balsamiq even offers an option to transform the image you insert into the hand-drawn style. Invision, focusing on teamwork, is a rapid prototyping tool that enables companies of all size to discover the design-driven product development and speak a common design language among both business and design teams. It insists the design philosophy that good designs in the early stage of a project narrow the list of engineering problems. Design teams usually collect and discuss feedbacks by email, which is deemed inefficient. But in the team version of Invision, designers distribute and discuss the project in real time. The whole process is in the management of workflow. Now more than 350,000 designers are using Invision in their work. UXpin is an online UX design tool developed by Desmart which allows designers to create interactive wireframes and user flows in minutes. It is based on outstanding user experience design principles. It offers a tool kit that contains great design modes and elements for designers to build a satisfying prototype from the very beginning. Co-design and getting feedback all comes in real time, you can comment directly on designs and notify your teammate at the right time. Marvel is a simple application designed for designers, PMs, start-ups and even students. It’s so friendly that allows you to link all your designs together in a jiffy, then add gestures and transitions to make your prototype feel just like a real app or website. Even if you don’t want to be a designer, doesn’t transforming your sketches into interactive prototypes sounds fun? Well begun is half done. If you start your design roughly it takes a long time to improve it. 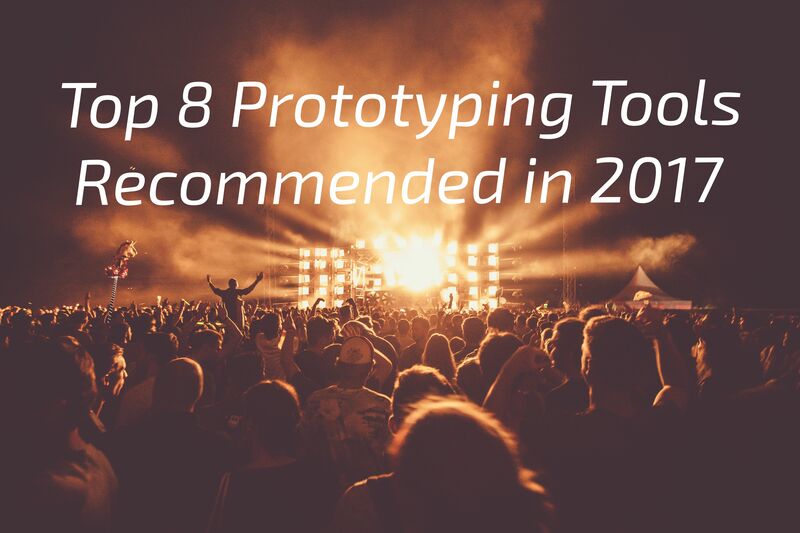 Try these prototyping tools listed above, you’ll find prototyping much faster and easier. If you know other prototyping tools that really help, leave your comments below.